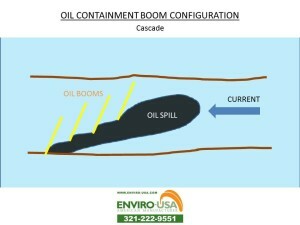 Home » OIL INDUSTRY » How to Select an Oil Spill Containment Boom? The Petroleum industry has come a long way from about 4 million barrels produced in 1930 to about 73 million in 2012. Products made from petroleum are found everywhere and range from basketballs to solvents to toothbrushes. Unfortunately the industry is also associated with water pollution and oil spills, such as the Deepwater Horizon accident in 2010 in the Gulf of Mexico. The first priority was to seal off the well. Then came the massive clean-up effort, which included some use of oil spill containment boom that acted as a temporary floating barrier. 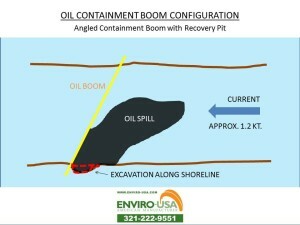 Containment booms help contain the oil in a restricted area to make the recovery easier. To maximize effectiveness, it is crucial to use the proper type of boom and specifications for a particular application. This article helps responders with the selection process. 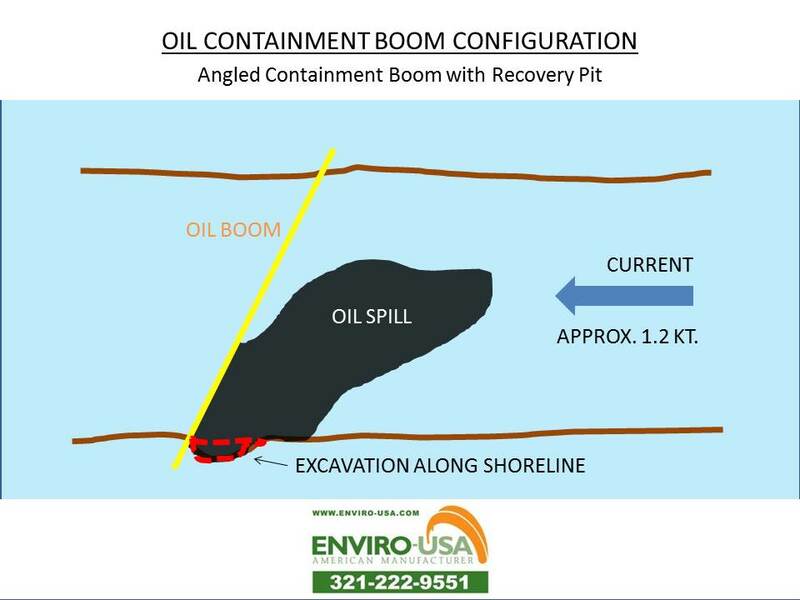 In terms of prevention, the SPCC program requires that Secondary Containment be present at oil storage facilities for the obvious reasons to prevent oil leakage from contaminating the ecosystem and damaging the soil or water table. Because oil wells, transportation and oil terminals are often on or near the water, special precautions must be taken to ensure any leakage can be contained in the marine environment. One of these measures is for oil spill responders to have oil containment booms available and on hand. 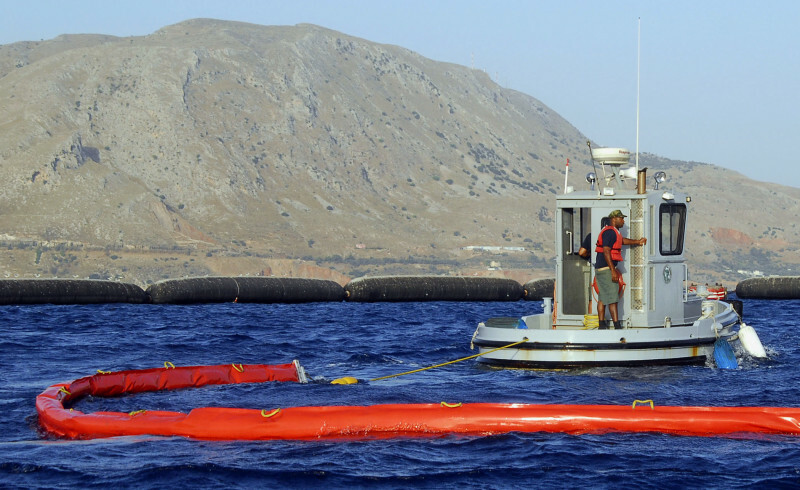 The prevention and clean-up efforts use the Environmental Sensitivity Index (ESI) to plan in advance the oil spill response in terms of priorities. Three factors go into the ESI mapping: the shoreline type (how sensitive would be shoreline be to an oil spill), the biological resources (ecosystem) and human-use resources (archaeological resources, importance of shoreline access points or protected areas). When the oil is still relatively fresh and the waters are somewhat calm, responders attempt to burn the oil slick before it reaches the shoreline. 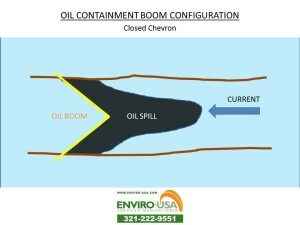 Some of the oil gets confined in a fire-proof boom and then is ignited. This method is controversial but was used in the 2010 Deepwater Horizon oil spill. A mixture of chemicals are dispersed by airplanes and/or boats to help break oil into smaller droplets so that less oil stays at the surface, which can reduce the risk of polluting the coast. 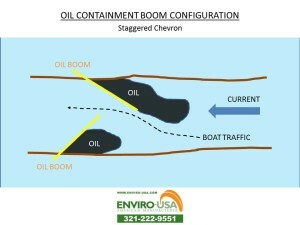 Special booms are towed by boats very slowly to collect the oil, which is then picked up by a skimmer. 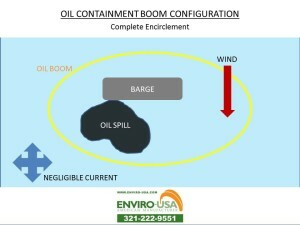 Enviro-USA manufactures three types of oil booms: standard, fast deployment, inflatable and fuel transfer booms. Spill responders must choose the right oil containment booms to ensure the structure works well for a particular application. 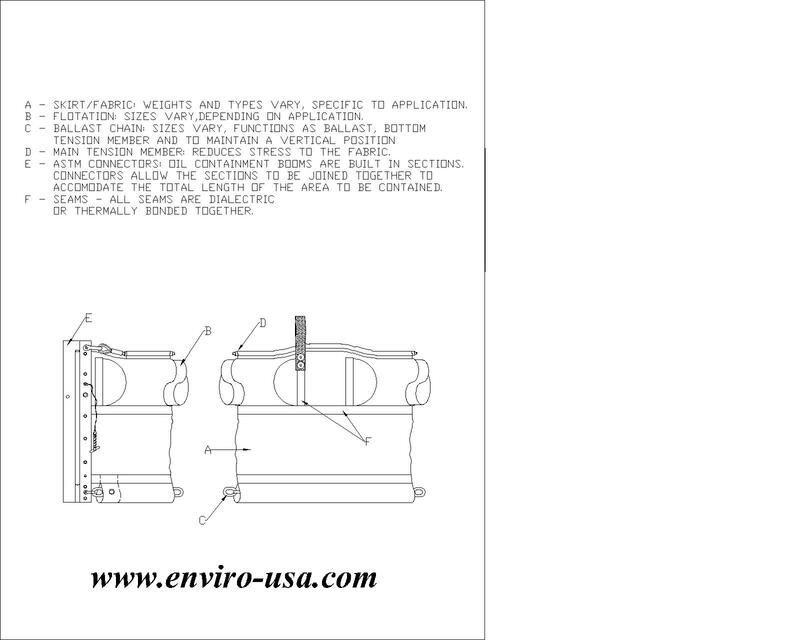 Enviro-USA’s standard oil booms are reliable and comply with OPA-90, US Coast Guard – OSRO and ASTM F1523 standards. They work great in ponds, rivers, ports, coastlines, offshore and pretty much any body of water. The size in inches refers to the distance between the top of the freeboard to the bottom of the draft. 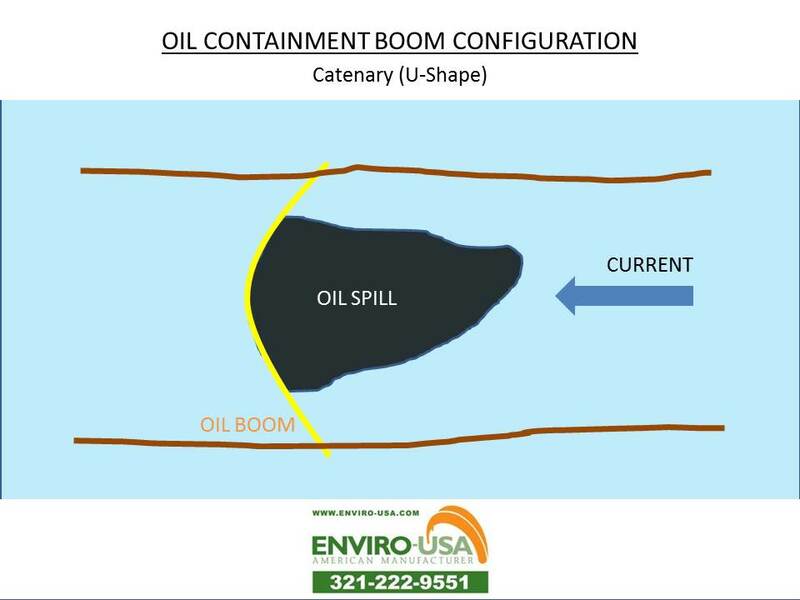 For example a 10 inch oil boom would most likely be suitable for calm water applications such as a pond and a 36 inch oil boom would be required for offshore applications so that the longer skirt of the boom prevents the oil from passing underneath. They also have more freeboard to help prevent oil from going over the top in rougher seas. This line of oil boom is designed to minimize the amount of space required for storage. They can be deployed quickly and with limited manpower with the use of a manual or hydraulic reel. 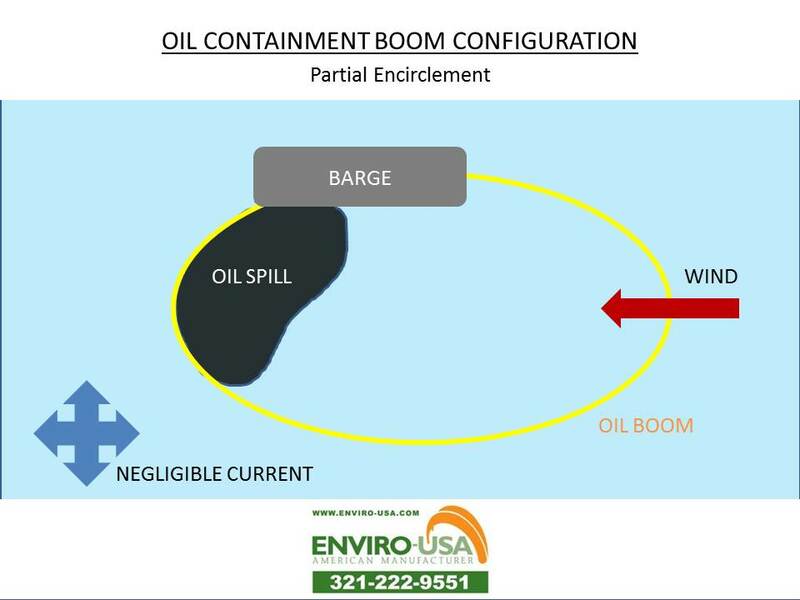 Like the standard booms, Enviro-USA’s fast deployment models also comply with OPA-90, US Coast Guard – OSRO and ASTM F1523 guidelines. They are great for emergency response in marinas and ports. 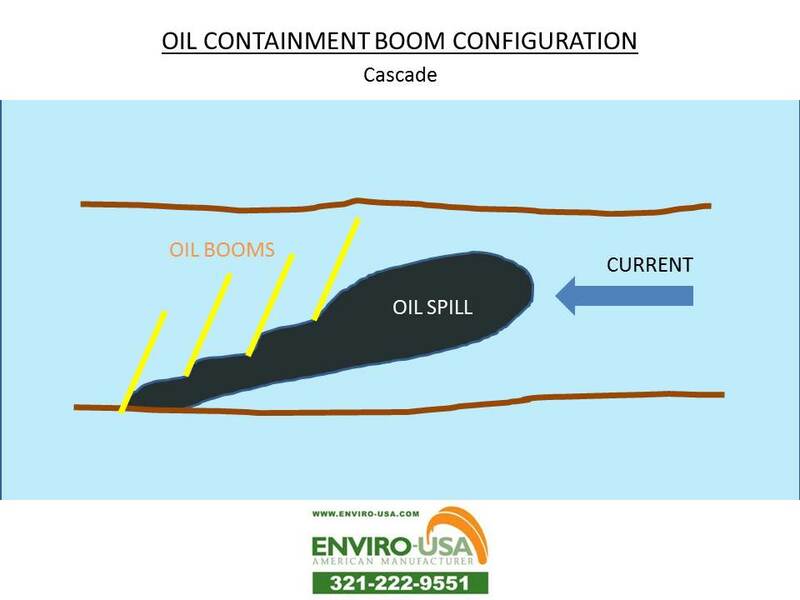 Enviro-USA’s inflatable oil booms are perfect when there is limited storage space or quick deployment is required due to environmental sensitive areas nearby. These are more expensive than standard oil booms. This type of boom is used when loading or off-loading fuel to and from ships and typically used by contractors responsible for fueling operations on cruise ships and other vessels. Enviro-USA’s fuel transfer booms are inexpensive, light weight and practical. Skirt/Fabric (A on drawing below): Weights and types vary and are specific to the application. Floatation (B): Sizes vary depending on the application. Ballast Chain (C): Sizes vary, functions as ballast, bottom tension member and to maintain a vertical position. Main Tension Member (D): Reduces stress to the fabric. 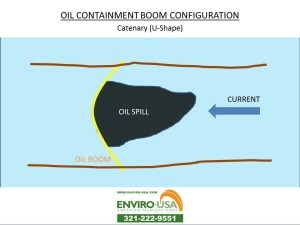 ASTM Connectors (E): Oil containment booms are built in sections. Connectors allow the sections to be joined together to accommodate the total length of the area to be contained. Seams (F): All seams are dialectric or thermally bonded together. Complete Encirclement: This design is usually used with negligible current. 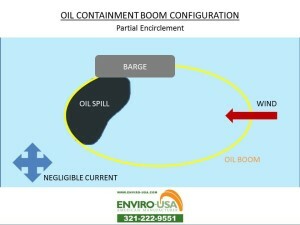 Partial Encirclement: As shown in this drawing, the collection barge is used close to confinement area. 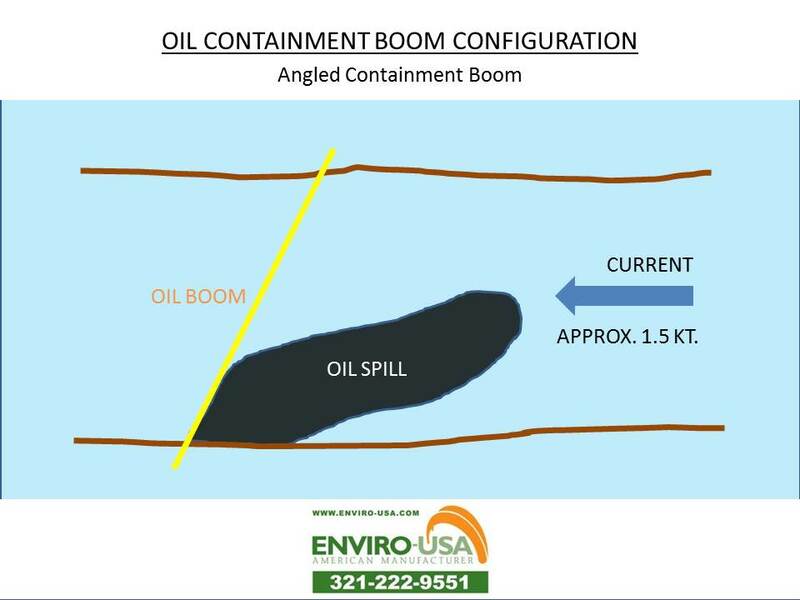 Angled Containment Boom: Use recommended with moderate current, approx. 1.5 kt. 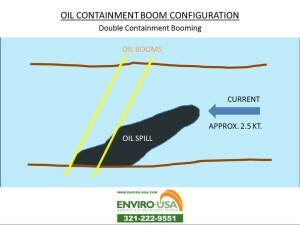 Double Containment Booming: Use recommended with current above 2.5 kt. 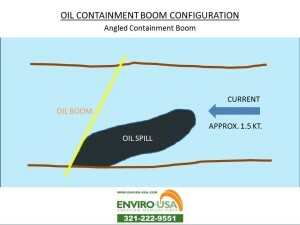 Angled Containment Boom with Recovery Pit: Use recommended with current above 1.2 kt. Staggered Chevron: Similar to the closed chevron configuration but allows boat movement. Enviro-USA offers its customers a free tool to help select the right oil containment boom system for any particular application. You will get a quick turnaround, recommendations and a cost estimate. 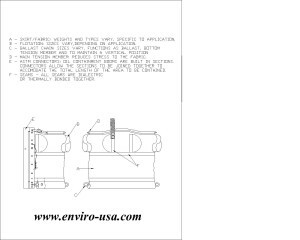 Greg Cassell has been in the turbidity curtain and oil spill boom manufacturing industry for over 40 years and now acts as designer and estimator for Enviro-USA, whose products have benefited from his extensive knowledge. Luis Vargas is president and oversees product development for Enviro-USA American Manufacturer, LLC.